I am joining in on White House, Black Shutters 40 Bags, 40 Day Challenge. It has officially been a week, so I thought I would share with you my progress and any tips and tid bits of knowledge I have learned along the way. So here are the “expert-preggers-mom-of-two-in-a-small-house-organizing tips” or what I’ve learned thus far. 1. Start small. 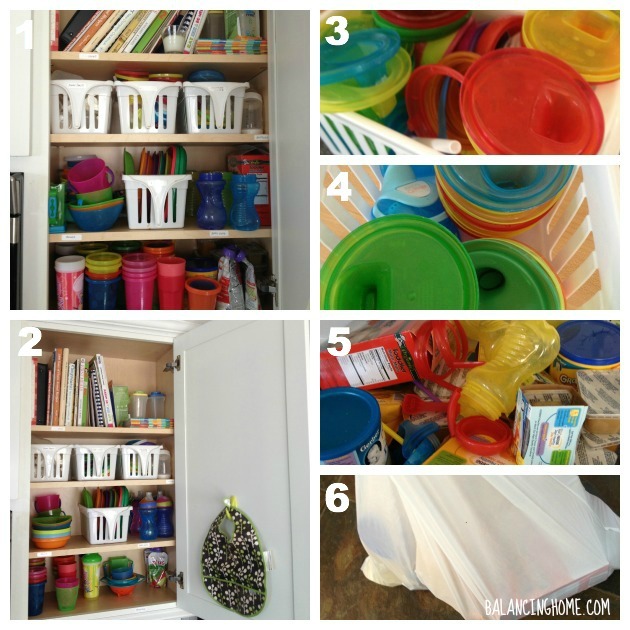 Organizing, simplifying and getting rid of stuff can be overwhelming. Pick one doable task and DO IT! The whole thing is kind of like a snowball affect. It will feel so good, you will be ready to tackle the next thing in no time. 2. Tips for a large space. When we worked on our basement I started where I would see the biggest impact. I gathered all the empty cardboard boxes and garbage first. Then I moved all the furniture to one space. After that I could move a bit and start to focus on the smaller stuff. 3. Pick something up and make a choice. Either throw it away, donate it or keep it. 4. Go through you keep pile and make sure everything has a home. 6. You can always buy a new one. Okay, in all honesty you aren’t suppose to run out and buy more stuff to replace what you are getting rid of, but reminding yourself you buy it makes it easier to get rid of. When you realize it isn’t the last piece of bedding or a pillow or shirt you will ever own it gets easier. 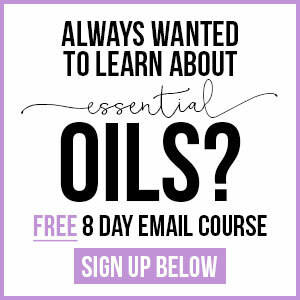 I cannot tell you how many times I told myself, “If I want new ______, I can buy new _______. Especially since I haven’t touched _______ in so long”. So those are my words of wisdom. I took my own advice and started small. Day one was the junk drawer. Sort! Sort! Sort! Like things together. 4. Test pens, only keep the good ones. 5. Oh my scissors and tape. I had no idea we had that many pairs of scissors or tape. Extra scissors and tape were relocated to the craft space. 6. TOOLS! Pretty sure we don’t need that many tools in the kitchen cabinet. The tape measure stayed and when the flashlight gets batteries, it can stay. Ross picked two screwdrivers he uses frequently to keep in the drawer too. 7. To think…we could never find a lock when we went to the gym. Not pictured- all the stuff that went straight to the garbage. 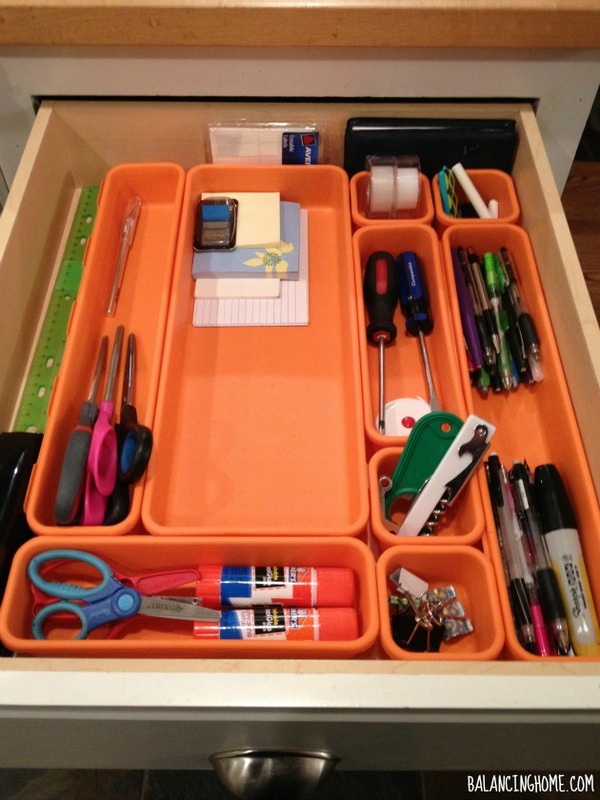 Now the original junk drawer had organizers- white ones, but I got fun orange ones as part of a craft space themed birthday present and I decided to use them in the space. TADA! The husband pointed out that if I don’t want the drawer to look like that again, I should refrain from calling it a junk drawer. He might have a point. Next up was the cabinet right about this drawer. The kid cabinet. You know, the one with all the sippy cups, plastic dishes, baby food etc. 1. Before. Organized, but overflowing. All the white bins are a Walmart find. They still carry them. I love them. I want more. They are very affordable. Enough said ;). 2. After. Trimmed down and check out the little Command hook I added to the door for bibs. Holla! I feel so smart. 3. Sippy cup lid explosion. 4. Pared down collection of sippy cup lids. I matched screw on sippy lids with cups. No match=garbage. 5. Pile of trash. Broken cups or cups without matching lids along with expired baby food. 6. Half a bag full. #winning. Day 3 we dropped off 2 bags at Goodwill from the “dangerous room”. You know the second bedroom upstairs that was once a junk room and is now being converted into Eleanor’s Big Girl Room (sharing more on that tomorrow). Day 4 was all about the night stands baby. I shared our Master Bedroom progress and it didn’t include these night stands, which had been sitting in our dining room waiting to be cleaned out. 1. All that stuff was in my husband’s night stand. 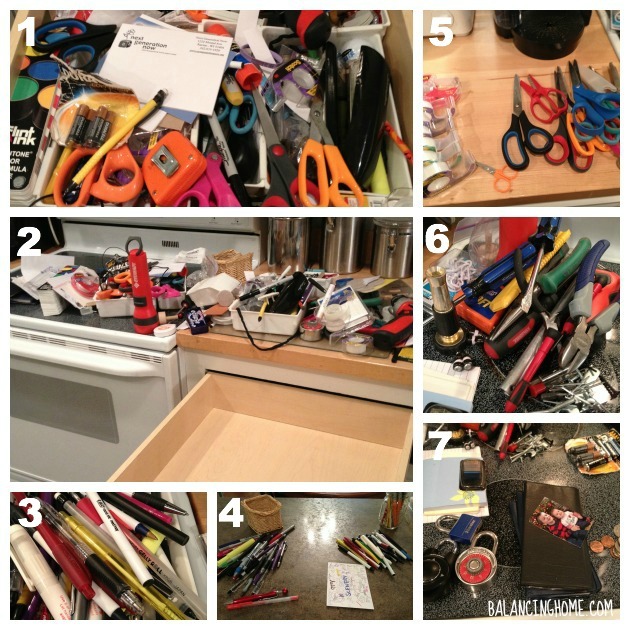 I followed the same process as the junk drawer. Clear it out, sort like things, and find everything a home. 90% of it is not night stand material. All of the font CD’s were relocated to the desk. The books to the book shelf. Most of the magazines recycled, etc. 2. His night stand. Clearly the night stand on the side of the bed opposite the door. Shudder. Sigh. 3. My night stand attracting randomness. 4. His night stand (before). 5. My night stand (before). We each have a basket on the bookshelf we are now using as a nightstand. That is where our “night stand” stuff went. The night stands were completely cleared out and then moved to the basement until further notice. Day 5 was all about the living room toys. 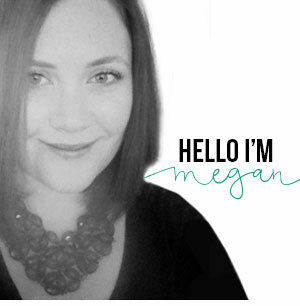 I actually wrote a post about living with kids and their stuff. The problem was all my kid storage runneth over. Time to simplify. 2. Baskets runneth over. Time to pare down. 6. Action figure bin before. 7. Action figure bin after. I actually have two empty bins. Squeal! The very next day the kids played with their toys so much more. I am not kidding. I think it gets overwhelming for them too. 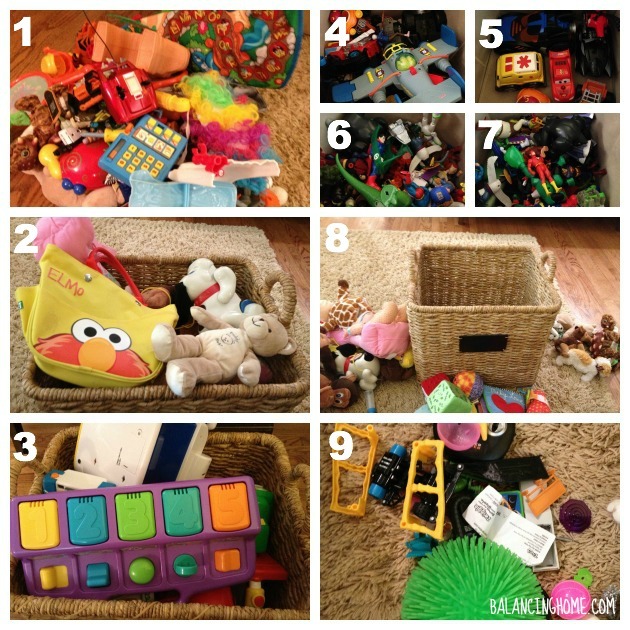 Fewer toys made it easier for them to find what they wanted and focus on what they wanted to play with. Day 6. Well I don’t technically have a day 6. We were crazy busy working on Eleanor’s big girl room over the weekend. So we were definitely focusing on the house and working to get things in order. We need to get Eleanor moved so we can get going on the nursery. I have been very careful about what makes it upstairs into her big girl room. Once she is moved in we will have to clear out the nursery. You can check out progress on Eleanor’s big girl room here. Day 7 AKA last night. Quinn is a little jealous of his sister’s reading nook (which will debut on the blog tomorrow). He really wanted one, so we picked up a curtain for his closet and got busy going through all the STUFF! 1. 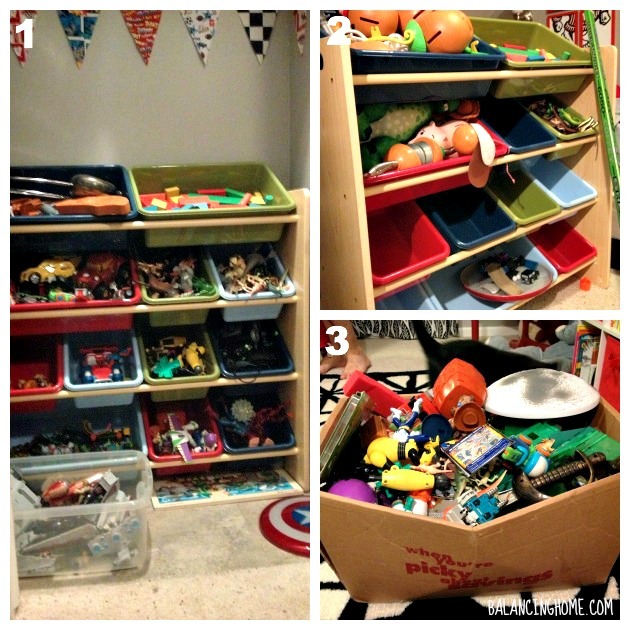 The toy bin that was in his closet. 2. The toy bin after we were done going through it. The toy bin is moving down to the basement to help coral the stuff down there. I still have quite a job for me in that basement, but one thing at a time. 3. Everything we are donating! Can you believe that he filled that entire box. He did better than I would have done on my own. So proud of him :). After all that hard work, here is what he is left with to enjoy. 1. Buh Bye toy shelf! 2. Top shelf has the game Operation, far out of Eleanor’s reach and the bins hold: 1) dress up clothes, 2) extra bedding for his bed.. Kind of love the shot of red over there. 3. Black bins I had on hand (organization bin hoarder over here). 4. Moved his bean bag in there and tucked in Bucky. 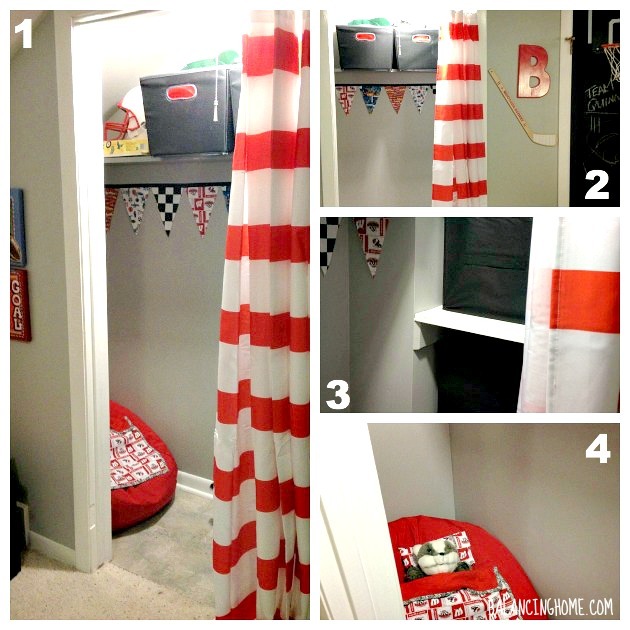 Click on over to see Quinn’s entire room reveal. Definitely a cool space for my little guy, made cooler by his little hideout. He was so excited it was worth all the work. Wowzers! That was a long post and a lot of work, but it feels SOO good! The less stuff you have, the easier it is to keep your house in order. All this and it has only been 7 days. Imagine what 40 will do. It isn’t too late to join either. Any of you been busy cleaning and organizing?